Girls mermaid lunch tote with personalization. Soft, dreamy flowing mermaids make this a lunch tote that stands apart from the everyday options. It is gorgeously feminine and fun with mermaids swimming off the edges and just a glimpse of their tales in sight! The tote can hold snacks, drink bottles, sandwiches and treats. Ideal for a school lunch, a day outing to the zoo or a visit to the neighbors. 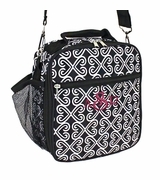 It closes with a secure zipper and can be carried easily using the comfortable handle on top. If you are looking for a perfect gift idea, create a set with a coordinating backpack and delight that little girl! Matching backpack available search item SJ-1121-28. Mermaid lunch tote measures 9 1/2" x 7 1/2 x 4". Vinyl lined interior. three sided zipper closure.